The increasing global scarcity of water combined with the booming population growth and aging infrastructure calls for drastically improved solutions and services. WAE Corp provides such state-of-the art solutions and services for any process-engineering task in the field of water and wastewater management. WAE Corp’s R&D is the mainstay of its business, anticipating clients’ future problems and innovating daily to find solutions. The water experts within WAE Corp’s network of researchers and developers work on every stage of the water cycle and every type of process. Safe water is the foundation of thriving communities. WAE Corp focuses on the best and most advanced ways to clean, move, control and conserve water. This work fosters health and wellness and fulfils one of life’s most basic needs for millions of people. WAE Corp focuses and specializes in water and delivers single source solutions to provide communities, business, industries with potable water. Our success is based on principles of sustainable development, which means we serve public and private clients of every size with a strong focus on life-cycle economy, efficiency and reliability. WAE Corp’s experience covers all aspects of water and wastewater treatments, including, sedimentation, filtration, disinfection and chemical addition, as well as advanced water treatment techniques such as Granular Activated Carbon (GAC), membrane filtration, ozonation, desalination and virtually all other treatment processes. Groundwater, surface water, brackish water or seawater, whatever may be the origin and quality of the resource, WA Corp has a complete range of technologies at its disposal to turn the resource into clean drinking water, ensuring optimum public health conditions. Municipalities, industries and real estate developers have come to rely on our innovative products and services, operational efficiencies and cost-effectiveness. From conventional to state-of-the-art membrane filtration and disinfection technologies, we offer water solutions that benefit industries and communities alike. Wastewater treatment includes all aspects of liquid and solid processing, as well as effluent disposal for both municipal and industrial clients. Liquid and solids treatment services include master plans, feasibility studies, pilot plant studies, conceptual design, final design, construction management, start up and training, along with operations troubleshooting, process and energy optimization. WAE Corp combines the industry’s broadest portfolio of technologies with strong technical expertise and proven installation experience across the entire spectrum of aerobic and anaerobic processes converting wastewater into a valuable resource with water reclamation and reuse strategies. Owing to regulatory changes and continuously improving wastewater treatment processes, quantities of sludge left over from treatments are constantly increasing. To tackle this problem, WAE Corp provides its clients a wide array of processes, ranging from digestion to destruction, including thickening, dewatering and drying. The goal is to turn sludge from a waste product into a product with added value for agriculture and or energy. 2.6 billion people do not have access to enhanced sanitation services. 50 % of the world’s fresh water reserves are polluted. 80 % of wastewater is discharged directly into the natural environment without prior treatment in developing countries. WAE Corp wastewater systems serve communities and industries efficiently while returning treated wastewater to the environment safely and efficiently. With an eye to the future, WAE Corp turns wastewater into a valuable resource with water reclamation and reuse strategies. Wastewater treatment includes all aspects of liquid and solids processing, as well as effluent disposal for both municipal and industrial clients. Liquid and solids treatment services include master plans, feasibility studies, pilot plant studies, conceptual design, final design, construction management, start up and training, operations troubleshooting, process and energy optimization. Reclaimed or recycled water is former wastewater that has been treated to remove solids and certain impurities, and then reused for a variety of applications including landscaping, irrigation, and recharging groundwater aquifers. Treating water for reuse is an important part of water conservation efforts and in some regions of the world makes great economic sense. Recycling of treated wastewater is one way of securing the water requirements of arid areas and improving supply independence. WAE Corp offers tried and tested technological solutions to produce water from effluents that is suitable for industrial purposes, agricultural irrigation, recharging aquifers, watering of urban green areas and even drinking water. 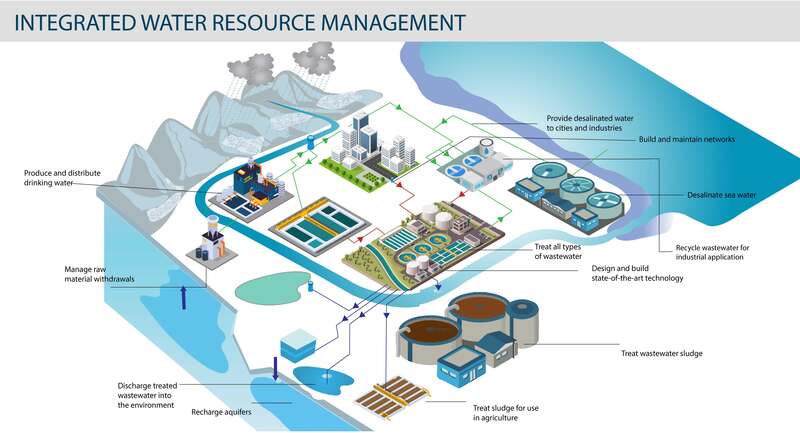 Industrial companies are aware that some of their water needs can be met with recycled water, thereby avoiding the need to tap hard-to access water resources and allowing them to optimize their entire water cycle. Water withdrawals from underground aquifers often exceed natural replenishment capacities. In areas where water is scarce, recharging aquifers with treated water (surface water, storm water, wastewater, etc.) represents an alternative solution to reduce the gap between the demand and the available resources. While treatment objectives may vary, WAE Corp has been helping industries meet water and wastewater treatment challenges for decades. Our solutions allow industries to reclaim and reuse wastewater, reducing the amount of fresh water the facility must purchase. Reclaim/reuse systems may also enable a facility to expand if there is a limit on the amount of fresh water that can be used. For facilities that must meet environmental regulations, reclaim/reuse solutions can reduce the volume and cost of wastewater discharged from a facility, potentially to zero if the customer is able to use evaporation ponds or a thermal mechanical process, such as evaporators, crystallizers, or dryers. Many Industrial facilities can also reduce operating costs by treating wastewater to produce high quality water, for reuse at its facility, thereby decreasing chemical consumption in the cooling Towers, Boiler, etc. WAE Corp has provided reclaim/reuse systems to all types of industries, including Power Generation, Pulp & Paper, Microelectronics, Food & Beverage, Pharmaceutical, IT & ITES, Automotive, Oil Refining/ Petrochemical, Developers and Textiles. Each of these industries has different sources of wastewater that must be evaluated carefully to find the right treatment solution.